Kit for mounting the DT980X Series USB modules to a DIN rail (Metal Box/BNC connector versions). 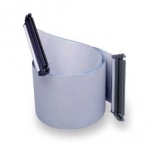 Horizontal or vertical mounting fits any application. Includes mounting clips, screws, mounting adaptor, and instructions. Rail not included. Cable, 50-conductor ribbon, 100-pin, high-density to two 50-pin IDC, 2 ft.
Cable, 50-conductor ribbon, 100-pin, high-density to two 50-pin IDC, 3 ft.
Cable, 50-conductor ribbon, 100-pin, high-density to two 50-pin IDC, 5 ft.
Cable, 50-conductor ribbon, high-density 100-pin to dual 50-pin, 3 ft.
Cable, 50-conductor ribbon, high-density 100-pin to dual 50-pin, 6 ft.
2 feet long, 37-pin cable with female D type connectors on each end. Available in 1, 2, 3, 4, 5, 10, 15, 20, 25, and 50-foot lengths. For these lengths, order the C37FF-#, where # is the desired cable length in feet. 5 feet long, 37-conductor shielded cable. 37-pin female D connectors on each end. 5 foot long Ribbon Cable, 37-pin, male to male connectors. 50 conductor cable, female connectors on both ends. Available in 1, 2, 3, 4, 5, 10, 15, 20, 25, and 50 foot lengths. For these lengths, order the C50FF-# where # is the desired cable length in feet. 5-pin male DIN to 5-pin male DIN, 6 in. CA-195 100-conductor expansion cable, 3 ft.
100-conductor expansion cable, mates DaqBoard/2000 series with DBK200, DBK201, DBK202, DBK203, DBK206, DBK207, DBK207/CJC, and DBK209, 3 ft.
CA-195-6 100-conductor expansion cable, 6 ft.
100-conductor expansion cable, mates DaqBoard/2000 series with DBK200, DBK202, DBK203A, DBK206, DBK207, DBK207/CJC, DBK208, and DBK209, 6 ft.
Ribbon cable, 40-pin header to 37 pin DSUB, 9 in. Ribbon cable for use with 1 DBK device attached, 7 in. Cable, 68-conductor ribbon, 3 ft.
CA-68-3S Cable, 68-conductor shielded, 3 ft.
Cable, 68-conductor shielded, 3 ft.
USB-1616HS Series to AI-EXP48 cable; Personal Daq/3000 Series to PDQ30 cable, 2 ft.
CA-G55 68-conductor ribbon cable, 3 ft.
68-conductor ribbon cable, 3 ft. Kit for mounting DT980X Series USB modules to a DIN rail. Kit for mounting ECON Series USB modules to a DIN rail. Horizontal or vertical mounting fits any application. Includes mounting clips, screws, and instructions. Rail not included. EP349 Terminal Block Set: Inc.six 9-pin terminal blocks. Screw terminal panel. Provides a 14-position screw terminal block for attaching analog input, digital I/O, counter/timer, and clock signals. For OEM configurations only. +5V power supply and cable. Required for OEM configurations. 1.52-meter cable with two 78- pin connectors that connect the STP78 screw terminal panel to the DT9862. Can be used with enclosure and -OEM versions. Input: 100-240V, 50-60 Hz Includes IEC power cord with UK plug. Replacement 230 V power supply, 9 V output, for SwitchAndSense-8/8, USB-2020, USB-ERB08, USB-PDISO8, USB-PDISO8/40, USB-SSR08, USB-SSR24 -Supplied with UK plug fitting. Screw terminal panel. Allows connections to analog input (except with MEASURpoint), digital I/O, counter/timer, and trigger signals.